Card Printer requires Internet Explorer, Edge or Chrome with extension to run. Explain Why? Card Printer with Chrome on Windows requires an Extension to start. Please install extension, or visit with IE. Card Printer requires Windows with Internet Explorer, Edge or Chrome with extension to run. Got an idea for improvements or new additions to this site? 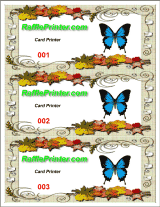 Click the Text button, or right click the Card to position and select Add Text. Enter your text, using the mouse-wheel to re-size. Left click and drag the text to position. Select desired font from the Font Selector dropdown. Click font selector dropdown twice, then with mouse pointer over top selected font in dropdown, roll the mouse-wheel to display the fonts and select the one you like. See Layer Overlap Order to make text blocks and images overlap in the desired order. Click the Color Picker, or position the Red, Green and Blue sliders to change the text color. Check the Italic or Bold checkbox for bold or Italic text. For multiline text, checking the Center checkbox will center the text on each line. Right click a text block to access Rotate and Opacity menu. To rotate a text block (or image), right click and select a rotation increment, or hold the Right CTRL key down and roll your mouse wheel. Select desired effect for individual text blocks. 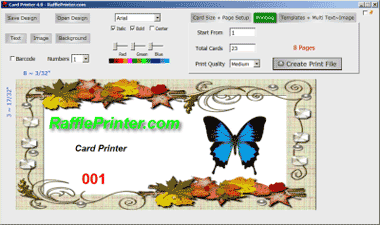 Right click an empty area on the Card and select Save Background to save an image template of the Card. You can reload this template later with the Get Background menu item.